Nine thousand one hundred and twenty-five days had passed since we parted. The affair had lasted almost five years. It had been exciting, all-consuming, and at times even torrid. She had taken me to places I had never been before. My 1982 Honda CB1100RC, my first true love, was exotic, rare, and many sought after her. Maybe it was inevitable that we would part.But I would never forget her. I sort solace in an arranged union with a Honda CT110, courtesy of Australia Post. It was a relationship that could never fill the void, never satisfy. She was stout and robust, even fun at times, but reliability cannot replace passion, monotony cannot restore desire. The time had come to find another, and the computer age gave me opportunity. 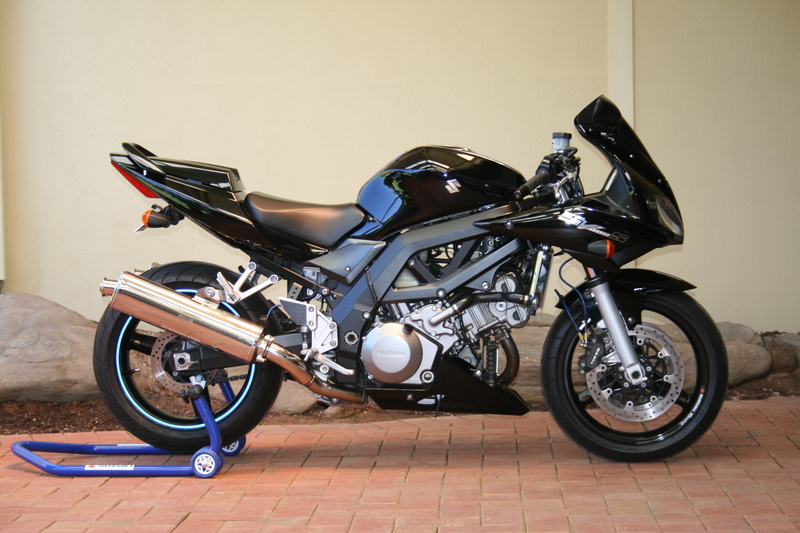 I found her locally, a 2006 Suzuki SV1000s. She was magnificent, black, lithe and beautiful. I nervously arranged a meeting. Then panic struck. Would I be man enough for her? Could I take her to the edge and back again? Mono-shock rear suspension, precision die-cast alloy frame, my god – she has fuel injection and liquid cooling! Her suspension front and rear are fully adjustable – preload, compression and rebound damping. She boasts a hydraulically operated rear torque limiting clutch, steering damper, adjustable brake and clutch lever, magnesium camshaft and ignition covers, hollow cast alloy wheels and L.E.D. tail and instrument lights! What had seemed a long time between loves suddenly felt like an eternity. When I took her out for that first time, it was as if we had known each other all our lives. Our frames melded together, a perfect fit for my 1.7-metre stature, both feet planted firmly on the ground thanks to her 800mm seat height. I pressed her button and could feel her pulsating 996cc V-twin heart beating heavily beneath me. As we prepared to depart a torrent of thoughts flooded my mind. I had learnt during my internet quest that madness lurked in her blood-line. Her forebear the TL1000s suffered “dissociative identity disorder”, a combination of a more highly strung personality and an innovative but inadequate rotary rear damper. Too much throttle from the light switch like fuel injection system gave a propensity for the TL to wheel stand out of slow corners and shake her head viciously in fast ones. Suzuki retrospectively fitted a steering damper to early models and made it mandatory for those made after that. There were also whispers of cracks appearing in her alloy tube trellis frame. Like so many with these deep-rooted problems, it brought about a short life expectancy, a brief but tumultuous five years (1997 – 2001). 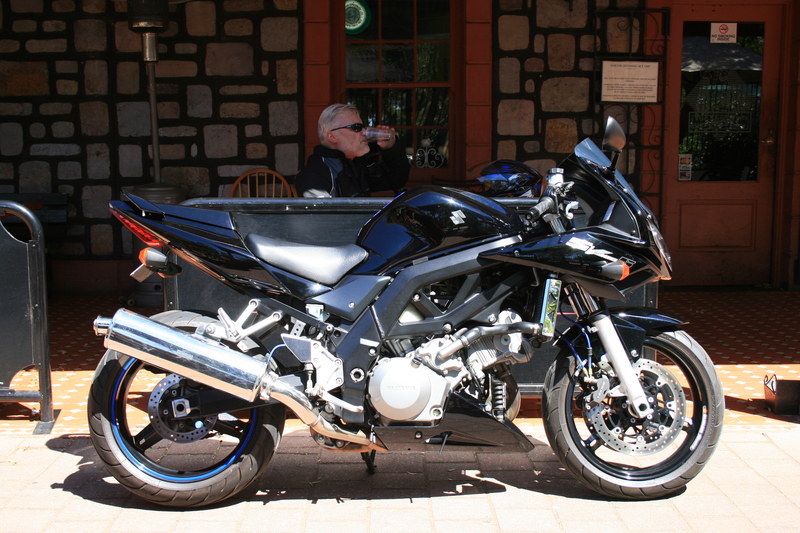 How much of the TL1000s DNA did my SV1000s possess? Was it Oscar Levant that said, “There is a fine line between genius and insanity”? It was time. I slipped my black beauty into first and slowly pulled away. Her ‘box was smooth and slick as she jumped forward – so much grunt from so low down! Although her beating heart was of the same lineage as her mad older cousin, Suzuki claimed over 300 detail changes to her V-twin, aimed specifically at improving midrange torque and ride-ability. Yet she still gives 87kw (118bhp) against the TL1000s’ 92kw (125bhp) and 104nm of torque at 7000rpm compared to 105nm at 8000rpm. And she weighs 5kg less. I tried to clear my head of all this nonsense as our pace increased. A slow turn approached. I squeezed her brakes and snicked down through her gears slowing ridiculously short of the bend. My inexperience with a big V-twin did not take into account her pronounced engine braking or the quality of her stoppers. We kissed the apex together as I rolled my right hand back making her rear squat down as she thrust forward. I gripped her with my thighs as my torso lay atop of her holding on tightly. The world rushed by. We were moving together as one now rolling from side to side, scything through the faster turns with aplomb. The sound emitted from her two big lungs through the Staintune slip-ons brought a wondrous crescendo as each gear hit 9000rpm (I know I could have pushed harder, like the mad one, she redlines at 11000rpm). But we had reached the climax of our trip together, slowing gradually for one of the small townships scattered through the Adelaide Hills. The liaison had been sweet and short, as these days my endurance is not what it once was. But she had handled herself with poise and grace, a true lady. A soft drink and a cigarette gave time to relieve the pressure that had been placed on my wrists and thighs and occasion to take in the perfection of her parts as she waited by the road. The journey home was a relaxing one, keeping her between 4000 and 6500rpm, just riding the torque and enjoying the scenery. Oh and that glorious exhaust note! …a soft drink and a cigarette. There are some that might say she is nothing more than an ageing model. But she has retained her youthful looks and has so much to offer any partner. Why did Suzuki cast out her kind? Was a short-lived life span, (again) of five years (2003 to 2007) due to death by association to the insane TL1000s? Yes, her transplanted heart lives on in her second cousin the V-Strom, but why was one so beautiful given up for a homely farm girl? Ducati has shown what can be achieved with a sports V-twin, yet their early ancestors were hardly easy to live with. 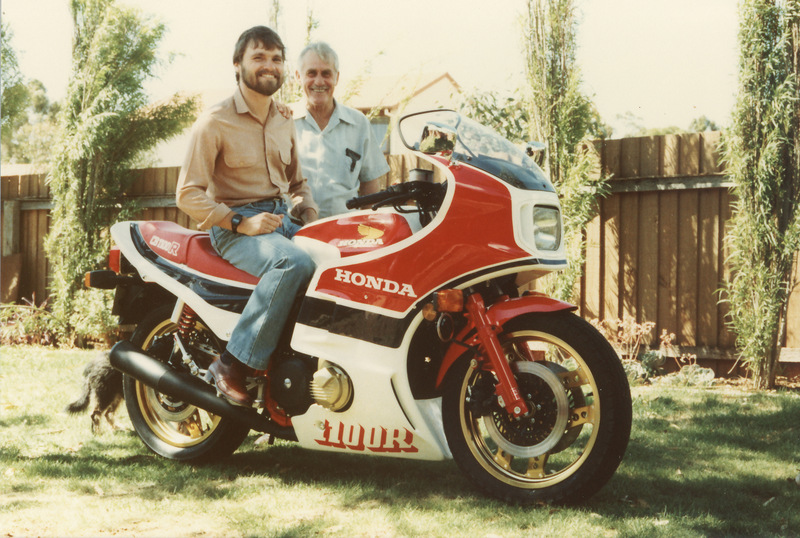 They say a gentleman never compares loves, but my CB1100RC produced 2.21kw (3bhp) less, weighed 47kg more and redlined at 1500rpm below my SV1000s. 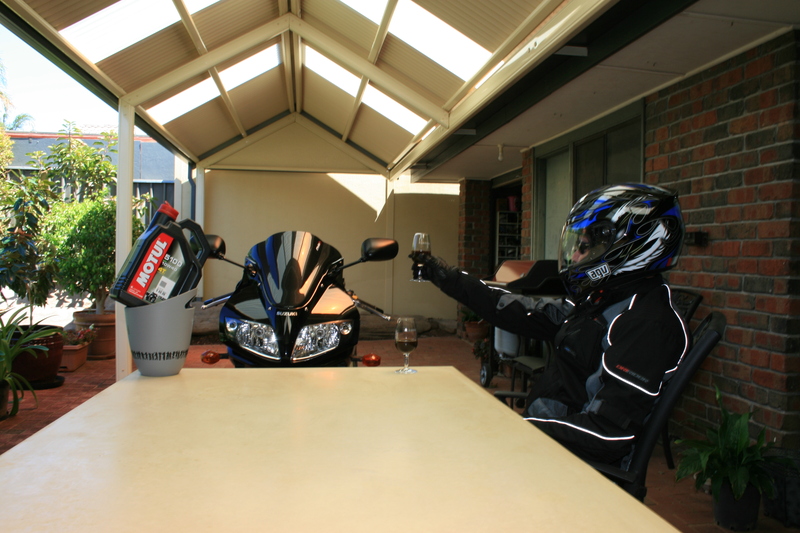 No matter, if my CB1100RC was my first true love, then my SV1000s is not only the love of my life but my soul mate. Words Geoff Dawes (C) 2013. Photographs Geoff and Harrison Dawes (C) 2013. 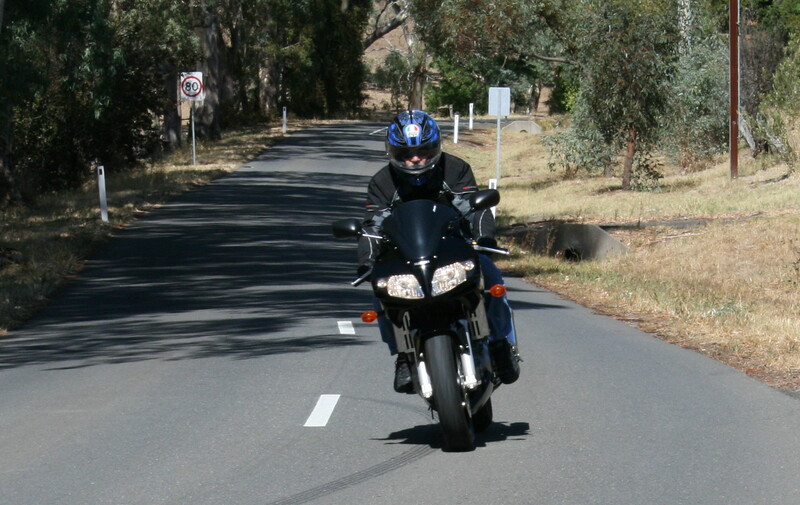 This entry was posted in Motorcycling and tagged Adelaide Hills, Australia Post, Fuel injection, Honda CT110, Oscar Levant, Suzuki, Suzuki SV1000, Suzuki SV1000S, V-Strom on 01/07/2013 by Geoff Dawes.